Heather Lancaster is an Atlanta native who hails from a family of artists. Growing up, conversation at home circled around composition, color theory, perspective, and line quality. 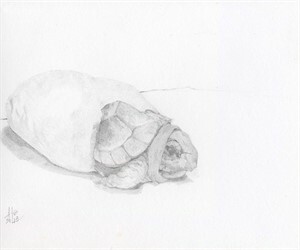 Rather than photographs, she and her siblings have her mother’s drawings and paintings as primary documentation of their childhood. It seems only natural that such an atmosphere fostered a profound appreciation for art, even as a child. Heather began her own study of art and visual expression as an adolescent and continued it throughout her college years and beyond. 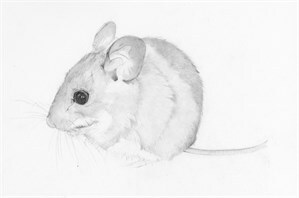 Her awareness of and love for the beauty in nature and wildlife is evident in her sensitive, finely rendered drawings of animals and botanical elements. 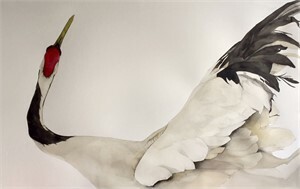 Her latest body of work "One Word From the Crane: The Eloquence of Restraint," focuses on the japanese crane. 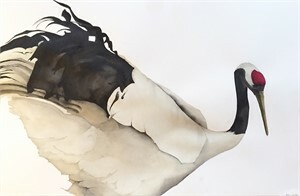 Employing subtle hues, high contrast, and multiple layers of graphite, India Ink, and charcoal, Heather Lancaster depicts the striking elegance of the Japanese Crane. Tsuru no hito koe, "one word from the crane," resonates with Lancaster. There's great impact in a singular, authentic voice… a voice committed and unwavering, soft or low but clear, undeniable… a voice with authority. Through the representation of the Crane's lithe gestures, Lancaster aims to convey the impact of quiet action, and the dignity of restraint. In the Crane she sees beauty and strength of convictions without judgment, of kindness and compassion, and of the courage to stand for truth. Heather Lancaster is an Atlanta native who hails from a family of artists. Growing up, conversation at home circled around composition, color theory, perspective, and line quality. 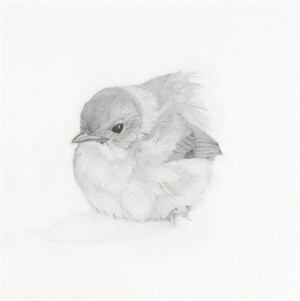 Rather than photographs, she and her siblings have her mother’s drawings and paintings as primary documentation of their childhood. It seems only natural that such an atmosphere fostered a profound appreciation for art, even as a child. Heather began her own study of art and visual expression as an adolescent and continued it throughout her college years and beyond. 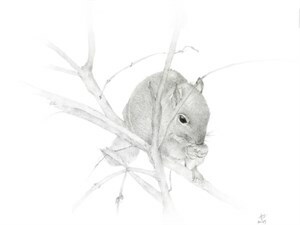 Her awareness of and love for the beauty in nature and wildlife is evident in her sensitive, finely rendered drawings of animals and botanical elements. 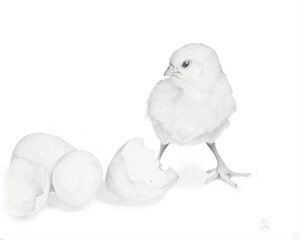 Her latest body of work "One Word From the Crane: The Eloquence of Restraint," focuses on the japanese crane. 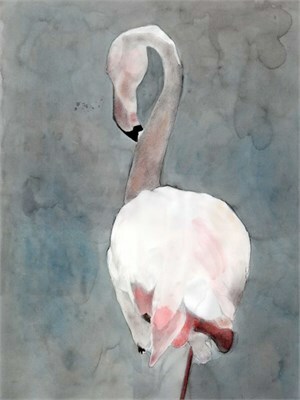 Employing subtle hues, high contrast, and multiple layers of graphite, India Ink, and charcoal, Heather Lancaster depicts the striking elegance of the Japanese Crane. Tsuru no hito koe, "one word from the crane," resonates with Lancaster. There's great impact in a singular, authentic voice… a voice committed and unwavering, soft or low but clear, undeniable… a voice with authority. Through the representation of the Crane's lithe gestures, Lancaster aims to convey the impact of quiet action, and the dignity of restraint. In the Crane she sees beauty and strength of convictions without judgment, of kindness and compassion, and of the courage to stand for truth.